Want to know a secret about life in college?Everyone-from the social butterfly in freshman orientation to the top student in Bio 101-feels a little unsure about the college experience. And that's completely normal! In fact, everyone could use a little help sometimes, especially in their first year. We know, because we've been there.But don't worry: We have you covered! From the day you set foot on… campus until the day you wear a cap and gown, get advice from a source you can trust: the expert and diverse team of all-star college students and recent grads behind U Chic.Campus Living - managing roommate relationships, and settling in that first semesterAcademics - schedules, majors, academic resources, and strategies for staying on top of your studiesSocial Life - tips and tricks on making friends, getting involved, and finding love in the age of appsHealth & Safety - partying smart, coping with the winter blues, and knowing when to ask for help College Perks - internships, study abroad, spring break, and more!Plus! 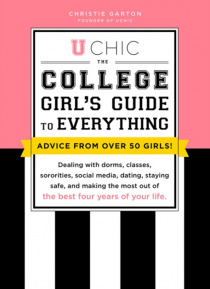 A brand new chapter on being a non-traditional student-its challenges, its joys, and how you can take charge of your college experience.We've got answers to your most burning college questions and tons of practical tips to ensure that you have the best four years of your life.We Are Supporting 1,000 Dreams: Every copy of UChic sold helps fund scholarships for high school- and college-aged women with big dreams. Learn more about UChic's 1,000 Dreams mission at UChic.com.